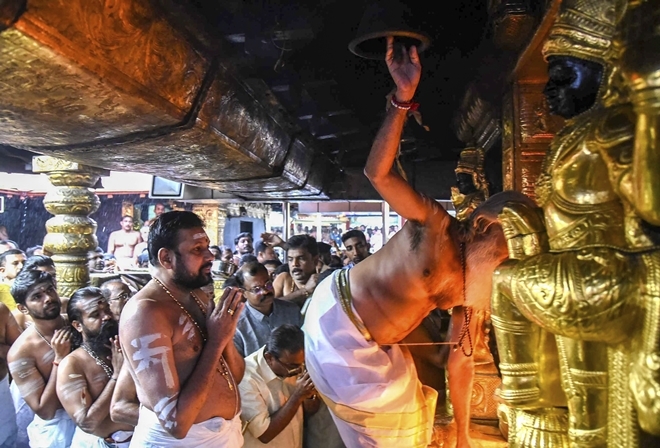 Sabarimala temple protest Live updates: Thousands of pilgrims on Saturday offered prayers at Lord Ayyappa temple in Sabarimala amid tight security even as a 12-hour strike by Hindu groups against the detention of a Hindu Aikya Vedi leader began at 6 am. Sabarimala temple protest Live updates: Thousands of pilgrims on Saturday offered prayers at Lord Ayyappa temple in Sabarimala amid tight security even as a 12-hour strike by Hindu groups against the detention of a Hindu Aikya Vedi leader began at 6 am. Today is the first day of Malayalam month of ‘Vrischikom’. According to a PTI report, devotees including children, queued up in large numbers since the temple opened at 3 am. All regular pujas were performed under the supervision of new Melshanti (chief priest) Vasudevan Nampoothiri. The hill shrine had opened on Friday evening for the two-month-long pilgrimage. On Friday night, Hindu Iykavedi (HI) chief and senior BJP leader KP Sasikala was detained by police while proceeding towards the temple. According to the outfit, she was detained illegally and the group has called for a shutdown in Kerala. The Kerala unit of VHP and BJP are backing HI’s strike call. According to reports, shops and other businesses were forced to down their shutters by HI, BJP and Sangh activists. Barring private vehicles, all other public transport vehicles stayed off the roads in many parts of the state. Schools and educational institutions were also closed today. Meanwhile, the Travancore Devaswom Board (TDB) has decided to move the Supreme Court on Monday. The board said that it will seek more time from the Supreme Court to implement its September 28 order to allow women of all age groups inside the temple. In Kerala capital Thiruvananthapuram, passengers had a tough time in getting vehicles to reach their respective destinations due to the hartal. Many patients and their relatives were unable to reach the regional cancer centre and Thiruvananthapuram medical college hospital. KSRTC Managing Director Tomin J Thachankary said the corporation was running buses in Sabarimala with police protection to help pilgrims reach the temple. In Balrampuram near Thiruvananthapuram, protesters attacked a KSRTC bus and damaging its windows, he told PTI. On September 28, the Supreme Court had granted women of all ages the right to enter Sabarimala temple, reversing the Kerala shrine’s tradition of barring girls and women of menstruating age. The SC bench headed by then Chief Justice Dipak Misra had passed the verdict with 4:1 majority. The top court had held that the ban was derogatory, illegal and unconstitutional. According to the centuries-old practice, women and girls between 10 and 50 years (menstruating age) are not allowed to visit the shrine which houses Lord Ayyappa. Thousands of pilgrims offered prayers at Lord Ayyappa temple in Sabarimala early on Saturday. Today is the first day of Malayalam month of 'Vrischikom'. All regular pujas were performed under the supervision of the new Melshanti (chief priest) Vasudevan Nampoothiri. Pilgrims, including children, queued up in large numbers since the temple opened at 3 am. The temple had opened Friday evening for the two-month-long pilgrim season. State BJP chief PS Sreedharan Pillai said that no one knew the reason why Sasikala was detained. Pillai said that the Pinarayi Vijayan government here wants to destroy Sabarimala temple. He said that the new rules will affect the traditions of the temple. "Vijayan is using the arrogance associated with power to achieve their mission and this will be strongly resisted," the BJP leader said. According to PTI, VHP's kerala unit president SJR Kumar has said that essential services and vehicles of Ayyappa devotees will not be affected by the shutdown. The Sabarimala temple has witnessed protests by Hindu groups after the Supreme Court on September 28 passed an order allowing the entry of women aged between 10 and 50. Hindu fringe groups have called for a shutdown in Kerala to protest against the arrest of a few religious leaders last night. The most prominent among the arrested were Hindu Iykavedi (HI) president and senior BJP leader KP Sasikala. Hindu Iykavedi leaders have called for 12-hour strike backed by Kerala unit of the BJP. Meanwhile, shops and other businesses were forced to down their shutters by HI, BJP and Sangh activists. Barring private vehicles, all other public transport vehicles stayed off the roads. Schools and educational institutions are closed for the day. Kerala Chief Minister Pinarayi Vijayan has sought cooperation of all to ensure a peaceful Mandala - Makaravilakku pilgrimage season in Sabarimala. In a Facebook post on Friday, he said that the LDF government's objective is to uphold the esteem of the hill shrine. He also urged people not to fall for fake news and media not to publish misinformation that can cause disturbances. "Some are also using social media networks to propagate misinformation with an intent to disturb peace. Such activities must be monitored and reported to the authorities. People who love Sabarimala and Kerala must not fall for such misinformation that is part of a propaganda," his statement reads. 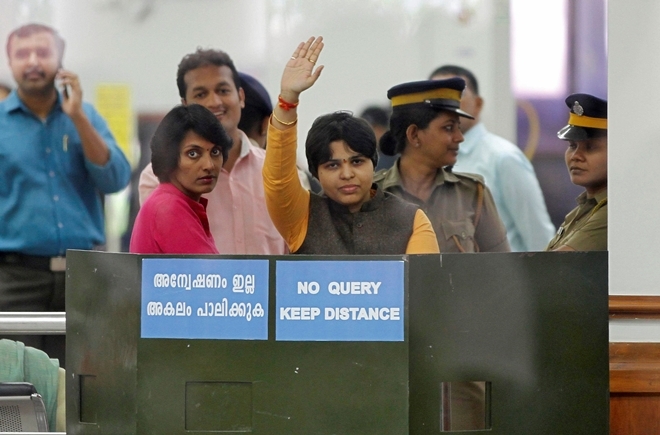 A report in news agency IANS said that Trupti Desai and others way were blocked by hundreds of BJP and Hindu activists at the Kochi airport, forcing them to remain holed up at the airport. It said that activists were also greeted by protesters upon return outside the Mumbai airport. Desai and others were had to be escorted with the help of CISF personnel and Mumbai Police officials. Gender activist Trupti Desai who reached Kochi on Friday to offer prayers at the Sabarimala temple, was forced to return. Desai was accompanied by six other women. They were forced to remain at the airport for nearly 13 hours. Later in the evening, Desai said that she is returning but vowed to be back before January 20. The doors of the temple will be closed on January 20. VHP's Kerala unit president SJR Kumar told PTI that Hindu Aikya Vedi state president KP Sasikala was arrested by police near Marakkoottam. According to Kumar, she was arrested as she was on the way to the hill shrine carrying irumudikkettu (sacred offerings) to offer prayers. 'Some other activists have been taken into preventive custody,” he said. Kerala:Sabarimala Karma Samithi calls statewide shutdown today from 6 am-6 pm in protest against arrest of Hindu Aikya Vedi state Pres KP Sasikala at Marakkoottam last night.She was going to Sannidhanam&arrested after she protested when police didn't allow her to travel at night. Sabarimala: Police personnel stand guard as the Sabarimala temple opens for a two-month long pilgrim season, in Sabarimala, Friday, Nov. 16, 2018. (PTI Photo) (Story no. MDS18) (PTI11_16_2018_000157B)Meanwhile, unprecedented security arrangements have been made at the Sabarimala temple. The hill shrine opened on Friday for the two-month-long pilgrimage. This is the third time when temple is opened to pilgrims since September 28 historic verdict of Supreme Court to lift ban on entry of women of menstrual age. The current 41-day mandalam festival will end on December 27 after Mandala pooja, when the doors will close after Athazhapuja in the evening. It will reopen for the Makaravilakku festival on December 30.